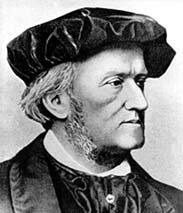 The great German opera composer Richard Wagner (1813–1883) was a major transitional figure from late Romanticism to the 20th Century. The richness and chromaticism of his harmony in Tristan und Isolde pushed tonality to its limits, influencing composers like Debussy, Franck, Chausson, and d’Indy. Because Wagner looked at an opera as a culmination of the arts rather than a collection of set pieces, he wrote his own librettos, created musical signatures (leitmotifs) for characters, objects, places, and ideas, expanded the orchestra, and referred to his mature works as “music dramas.” His first opera, Die Feen, reflects the classical style of Weber; Das Liebesverbot drew on the Italian bel canto, and Rienzi from the grand opera of Meyerbeer. Flying Dutchman marked the beginning of his maturity, though it retained some old style set pieces. Tannhäuser is broader and fuller than Dutchman, and is Wagner's first opera based on German legends. Wagner then considered following the Athenian dramatists’ practice of pairing a serious work (Tannhäuser) with a satirical comedy (about German Mastersingers). He had read satires by E.T.A. Hoffman, and he had read about the Mastersingers in Georg Gottfried Gervinus’s History of German Poetry and Johann Christoph Wagenseil’s Of the Meistersinger’s Lively Art. The Mastersingers were descendents of the Minnesänger (love song singers) from the German twelfth to fourteenth centuries. Their highly structured view of singing could be high-handed, but they were part of the backbone of the arts in medieval Germany. Of particular interest to Wagner was the poet Hans Sachs (already the subject of an opera by Albert Lortzing). Like all Mastersingers, Sachs was a craftsman, in his case a cobbler. The link between the two operas would be their song competitions and that each had a singer named Walther. After writing a scenario for Die Meistersinger in 1845, Wagner set off for a rest at the Marienbad baths, where a surging desire to compose an opera based on the German Arthurian legend of Lohengrin overcame his interest in Die Meistersinger. He wrote the final notes to Lohengrin in 1847. He then completed Das Rheingold, the first opera in his Ring Cycle, based on the German legend of Siegfried (about whom Hans Sachs had written a play). Die Walküre followed in 1856, but after finishing the first two acts of Siegfried, he was stalled by fears that he might never finish his huge Ring project, and that if he did, it might never see the inside of an opera house. The year was 1857. His last premiere, Lohengrin, had occurred seven years ago. What he needed was a new opera that could be easily and readily performed. His answer was Tristan und Isolde (1859), but an opera that pushed the concept of the “love song” and Western harmony to the point where it seemed unplayable was not going to be “easily and readily performed.” It was then that he decided to finish his “comedy,” Die Meistersinger. He produced a libretto in 1862, but financial and marital difficulties stood in his way. Fortunately, salvation arrived in the form of financial support from Ludwig II, who became King of Germany in 1864. Die Meistersinger von Nürnberg (1867) is Wagner’s most conservative and symphonic opera. Its diatonic harmony avoided the chromaticism of Tristan, and it did not require the array of instruments called for by the Ring. It was Wagner’s warmest and most congenial opera, his only mature comedy (after Das Liebesverbot), his only truly historical opera (though he had treated historical material, mainly in Rienzi and Tannhäuser), and his only major opera cast entirely for ordinary people (as opposed to gods and mythological or folk characters). On the other hand, its broad, detailed, and philosophical portrait of a people and a time required several great singers, and is almost five hours long. Fortunately, it caught on and established Wagner as a popular composer who could go on to complete the Ring and a theater at Bayreuth to perform it in. It is clear that the young Wagner was not ready in 1845 to express the human complexities presented by Die Meistersinger. Later he reportedly admitted that he needed to write Tristan before he could compose the love duet in Act III of Siegfried, and Die Meistersinger before he could express the joy in that act. Walther von Stolzing, seeking to join the Nuremberg bourgeoisie, is in love with Eva Pogner, daughter of Mastersinger and goldsmith Veit Pogner. Upon learning that the winner of the Mastersingers’ song contest on St. John’s Day (Midsummer Day) will be granted Pogner’s fortune and the hand of Eva, Walther auditions for the contest. He is told the complex rules for song composition, and that eight violations, listed by a Marker on a chalkboard, means elimination. Hans Sachs, a revered father figure in Nuremberg, argues that the people should have a voice, too, but is rebuked. Walther’s “Trial Song” runs afoul of the rules, and Sixtus Beckmesser, the Marker who also hopes to win Eva’s hand, flunks him with relish. On a Nuremberg street, Eva and Walther plan to elope. Beckmesser arrives to serenade Eva, but Eva’s nurse Magdalene is the one he is singing to in the window. As Beckmesser sings, Sachs, working outside, “marks” by pounding a shoe, upsetting his fellow Mastersinger. David, Sachs’s apprentice and Magdalene’s lover, recognizes Magdalene, thinks Beckmesser is serenading her and attacks him. A riot breaks out (a scene inspired by an incident Wagner witnessed years earlier). Sachs helps Walther compose a song that might win the contest. After a few misconceptions and comings together, Walther completes his song, and he, Sachs, Eva, David, and Magdalene sing a glorious quintet to “baptize” it. At the song contest in the festival meadow, Beckmesser makes a fool of himself with his entry. His failure and earlier shenanigans as Marker represent Wagner’s response to his own critics, particularly Eduard Hanslick. (Indeed, Beckmesser’s character was initially named Veit Hanslich.) The people exult over Walther’s Prize Song, and the Mastersingers go along. Walther turns down the award, but Hans Sachs convinces him to accept it because the Mastersingers’ support of German art was needed in a challenging time for Germany. Meistersinger — An Orchestral Tribute is in eleven sections played as one movement. It combines orchestral music and vocal sections, substituting instruments for singers as needed. The music is extracted from the scenes as noted. ACT 1 Prelude. Contains most of the themes from the opera, including the majestic one for the Mastersingers, the courtly entry music, and Walther’s song music. Meeting of the Mastersingers (Scene 3). A dignified theme in the low strings accompanies the assembling of the Mastersingers. ACT 2. Song of the Apprentices (Scene 1). A light and lyrical passage, followed by a duet between David and Magdalene. Sachs’s Monologue (Scene 3). Sachs ruminates over the day’s events. ACT 3. Prelude, one of the great pieces from the opera. On the morning of the festival, Sachs is sitting in his shop reading and pondering the situation, as a thoughtful downward figure representing his character is played in the low strings. Baptism of Walther’s Prize Song (Scene 4). The great quintet. Procession of the Guilds. (Scenes 4 & 5) Covers a scene change. It leads to some muscular music accompanying the entrance of the Guildsmen followed by more festive music as people gather for the contest. Dance of the Apprentices (hereon, all from Scene 5). Light ballet music for the apprentices. Arrival of the Mastersingers. The Meistersinger themes emerge; the Mastersingers enter and take their places. The scene ends with the theme from the Act III prelude. Walther’s Prize Song. Begins with a woodwind chord, then the melody in the clarinet. Conclusion. Lively and celebratory, with the Mastersingers’ themes, concluding with the grand march. Roger Hecht plays trombone in the Mercury Orchestra, Lowell House Opera, and Bay Colony Brass (where he is the Operations/Personnel Manager). He is a former member of the Syracuse Symphony, Lake George Opera, New Bedford Symphony, and Cape Ann Symphony. He is a regular reviewer for American Record Guide, contributed to Classical Music: Listener’s Companion, and has written articles on music for the Elgar Society Journal and Positive Feedback magazine. His latest fiction collection, The Audition and Other Stories, includes a novella about a trombonist preparing for and taking a major orchestra audition (English Hill Press, 2013).